On September 22, 2018 Colby Pearce set a 45-49 World Masters Hour record in Aguascalientes, MEX. 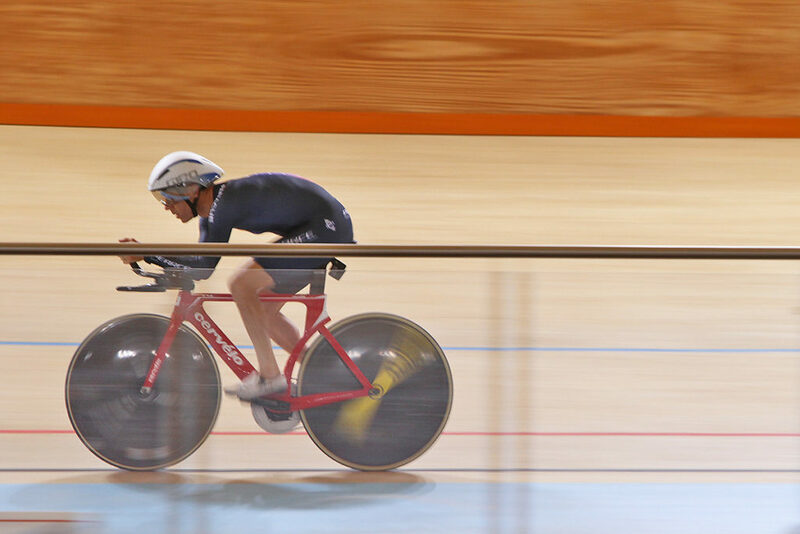 The previous record was 49.3KM held by Kent Bostick, set in Manchester England in 1999. The final distance of 50.245KM was 884 meters farther than the distance ridden in 1995 (in Colorado Springs) at the age of 23. “I have to be very happy with this performance, although in retrospect there are always things that can be further optimized”. 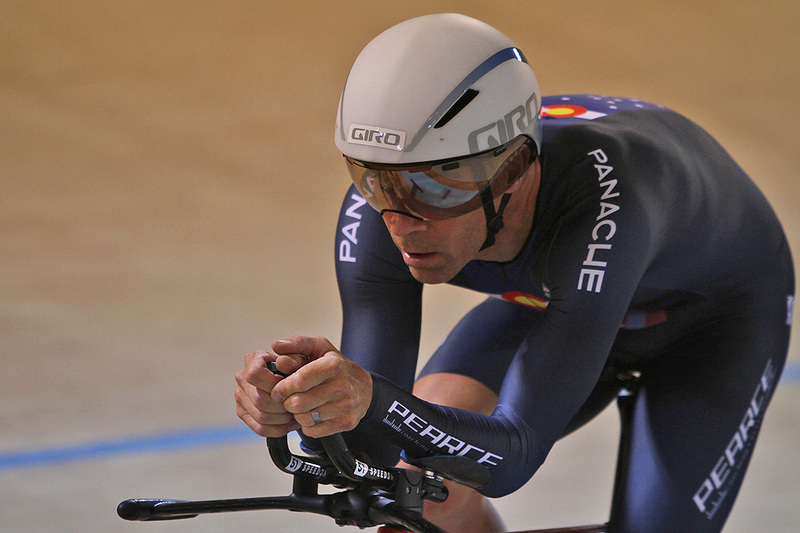 “In September of 1995 I set the Elite US hour record in Colorado Springs, CO using the full aero setup pictured above. I rode 50.191km in one hour and also set the 10km, 20km and 50km US records along the way. The previous record was held by John Frey (49.404km) and was also set in Colorado Springs, which is a concrete outdoor 333.3 meter track. Colorado Springs is 6035 feet above sea level. “As you can see, I was pretty decked out for 1995 – even today equipment does not get leaps and bounds faster. The full carbon Lotus frame was light years ahead of most other bikes in that age. 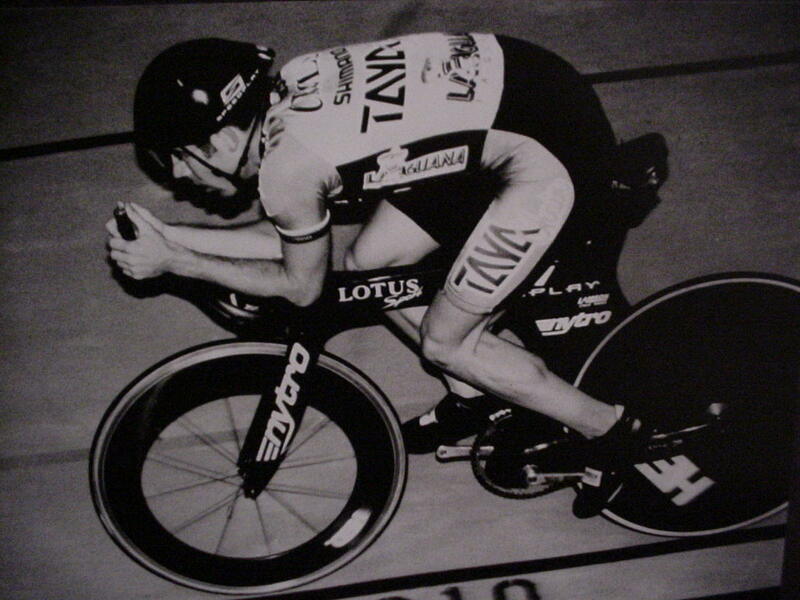 I had a deep front wheel (HED “deep”) and my position had been refined in the wind tunnel. I used a 55×14 gear and averaged close to 100 RPM. My average power, recorded with a SRM power meter, was 311 watts. My drag was measured in this position at Texas A&M at around 4.6 lbs @30 mph. As of 2015 I was still in the top 30 all time farthest distances ridden but that will change as more riders continue to tackle this event. I trained the entire season with this attempt in mind but after a storm delayed the construction of the Boulder Valley Velodrome, I was forced to move my attempt to Colorado Springs. I intended to try the record at the end of September in 2013 but then came more weather challenges, in the form of “1000 year” floods. After week of not riding and dealing with our house, which had considerable water damage, I almost decided not to ride. The entire city of Boulder had an apocalyptic feel, there was water everywhere for days and furniture floated down major streets after being liberated from storage units or living rooms. But, after reflection I realized that preparation for this ride had taken a lot of time and energy, and I had made a commitment to sponsors that needed to be honored, regardless of the outcome. My family had also endured my training and preparation, the least I could do is my best on the track to pay them back in a small way. Many local roads were closed so training required some creative problem solving. After finding excellent form in the early part of September, I did what I could to polish my abilities and went for it. Unfortunately, the result was a much shorter distance than I hoped for.